Have you ever wanted to become a professional speaker or increase your speaking capabilities? I’ve just launched a ground-breaking, 7-hour course just for you, including every trick in the book that I’ve learned over the years. I’m honoured to be in demand as a keynote speaker all over the world. The testimonials I have been given over the years have been wonderful and humbling to receive. If you have an event you feel I can add value to, check out my speaker showreel and other videos. 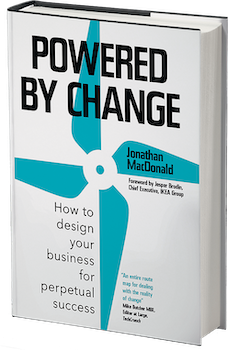 I’ve written a few but my most recent one, “Powered By Change”, became a Sunday Times Bestseller and won at the UK Business Book Awards, with a foreword by Jesper Brodin, CEO of IKEA. This book contains a summary of my thinking to date, regarding how to structure your business for perpetual success. Click here to discover my books. Subscribe now and get a free chapter of my Sunday Times Bestseller, Powered By Change.